Both computers and humans (animals) are memory systems. Nerves make up our biological computer. Our brain operates like wires and transistors in a computer. Memory, in a biological brain, and memory in a computer are essentially the same. Memory is the ability to store information. Living things are highly evolved computers. Living beings absorb store information as they move through life. The environment is realize as it moves into memory. Biological computers store information more efficiently, however both biological and computer systems are essentially memory machines. Hardware is the supporting framework for memory. Memory hardware is arbitrary as long it will store information. It is the information that is important. The underlying hardware merely supports the information. Memory hardware is only capable of three basic functions, reading, writing, and storing information. However these elemental functions can do great things. Memory makes a computer come alive. At the dawn of the computer age, when scientists realized they could store computer programs in memory (instead of on an external medium like punched cards), it was considered a revolutionary. Storing and running programs within memory gave the computer life. Similarly memory gives living beings life. Thinking is like executing a computer program. Program execution takes place in memory. Perception of reality takes place in memory too. 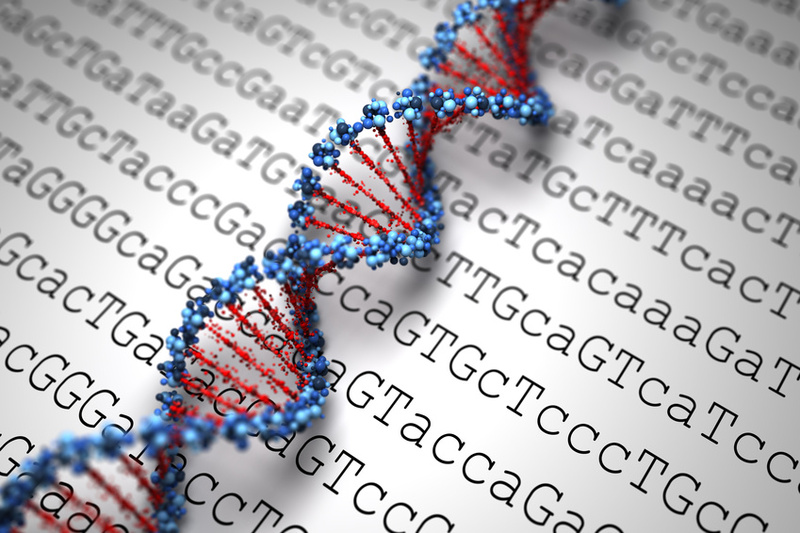 Memory, with its ability to store information, is fundamental to all living things. Memory is what gives a computer life. Memory is what gives living things life. Perception is memory. Memory is perception. 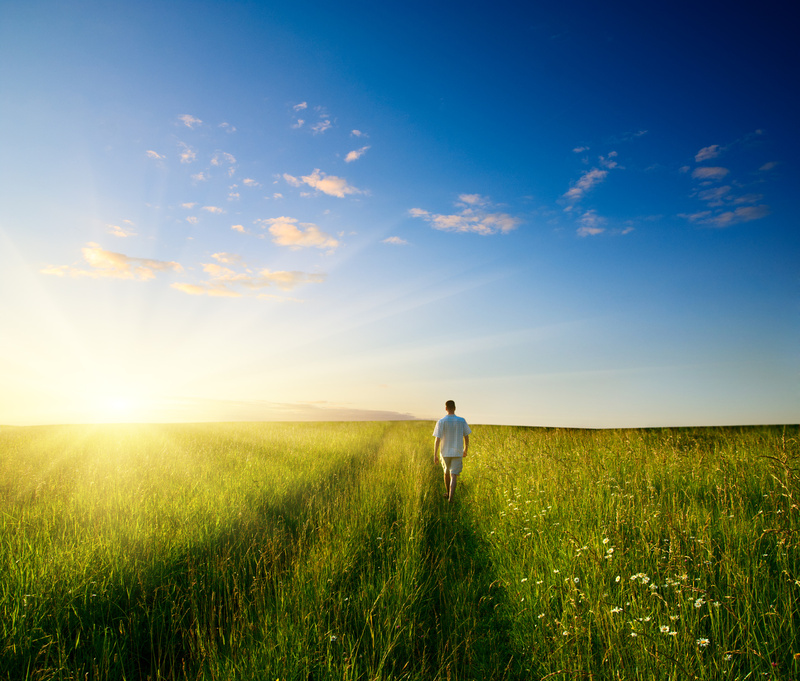 Understanding memory is key to understanding afterlife. Memory is the foundation of afterlife. To understand memory we are going to build it from scratch. Building memory this way shows us exactly how information is stored in hardware. When finished we will be memory hardware experts. Memory is created from these simple components. After building memory you will be see how simple it is. We will create a piece of memory. Then we will read information into memory and write it back out. Memory does not get more complicated as it gets larger. The basic elements remain the same. There are just more of then. As you read this section try to imagine how these same functions could by manifested in nerves of the body and brain. 1. When the input is turned ON, the output is turned OFF. 2. When the input is turned OFF, the output is turned ON. The NOT gate above has an electromagnet above the switch. Since there is no magnetic pull on the metal switch the switch sits in the closed position as shown on the left. Current is allowed to pass through the switch lighting the bulb on the other side. Closing input (shown as switch one) energizes the electro-magnet by applying current to it. The current goes into the coil wrapped around the electro-magnet and pulls the switch into the open position. This breaks the circuit (shown as two) and the light goes out. NOT gates are used in burglar alarms. When the circuit is broken, the alarm turns on. The NOT Gate is represented by a triangle symbol (shown in inset). 1. When both inputs are ON, the output is ON. The AND Gate will allow current to pass and light the bulb when current is applied to both inputs. The AND Gate is easy to remember because it will light the bulb when current is applied to Input 1 AND Input 2. The AND Gate is represented by the symbol in the inset. 1. When both inputs are OFF, the output is ON. 2. When either input in ON, the output is OFF. 3. When both inputs are ON, the output is OFF. We are showing NOR in the example below so you can see exactly how it operates. On the left no current is applied to either Input 1 or 2. With no current applied current passes through the NOR Gate and lights the bulb. On the right current is applied to Input 2, the lower electro-magnet. This opens the lower switch. Current is allowed to pass through the first gate, however it is stopped by the second gate. Current applied to either input will stop current from going through this device. The NOR Gate is slightly harder to understand than the other gates. This is because it turns ON when there is no input and OFF when there is input. The Flip Flop is two NOR gates wired together as show below. When NOR gates are arranged this way an amazing thing happens. The simple device gains the ability to store data. Once a flip flop is set to a state, it will remain in that state until it is reset. That makes the flip-flop perfect for storing data. Once set, it will stay in either the ON or OFF state indefinitely. Figure 1 shows the flip flop is one state where the top output is OFF. Consider this system at rest. With no current applied to either input the bottom NOR Gate is ON. This cuts off current to the upper NOR Gate. The flip flop will remain in this state indefinitely barring outside influence. Figure 2 shows current to the lower input. Figure 3 shows output of the lower NOR gate turning OFF due to current applied to its input. Figure 4 shows the output of the upper NOR gate turned ON due to no current applied to either input. Consequently current is applied to the lower NOR gate keeping it turned OFF. Now the flip-flop is set to a second state where the upper output is ON. It will stay that way and is at rest. The flip-flop is an amazing piece of hardware. 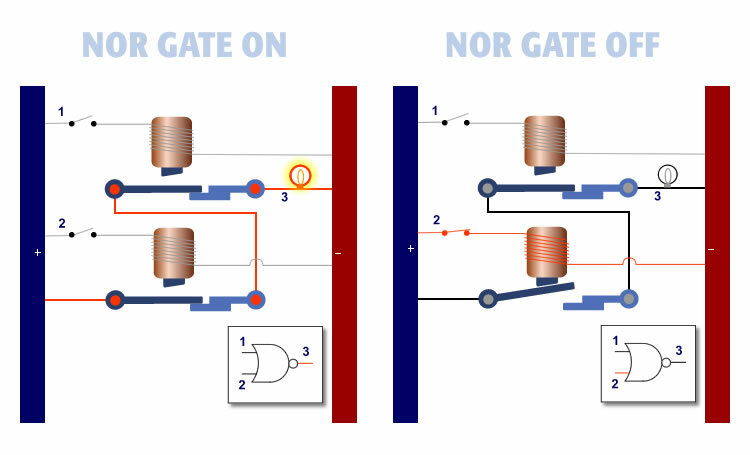 This simple arrangement of two NOR gates allows this device to store information. For example, if you have 16 flip flops you can store a 16 digit binary number. Merely set the digit 1 to state one and 0 to state two. When you set a number into the 16 flip flops that number will remain there indefinitely. The flip flop forms the foundation for memory. Given enough flip flops we can store unlimited data. It is hard to imagine how nerves could get together to arrange themselves in this manner to give rise to memory in living things. Perhaps memory in humans is based on a completely different hardware structure however this is one way to store information into hardware – be it transistors or nerves. Figure 1 shows the bit at rest in OFF status. NOR Gate B is ON because there is no current on either input. Figure 2 shows the input line turning ON. Figure 3 shows the clock line turning ON. Note that both inputs on the lower AND gate are turned ON. 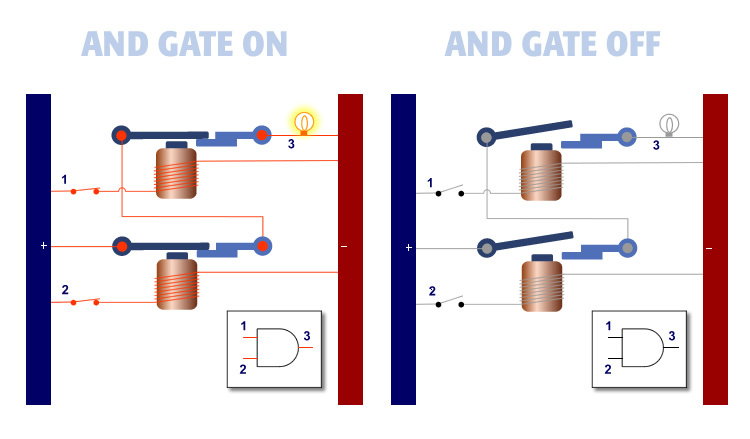 Since both leads are ON, current passes through the AND gate into the lower NOR gate B. Input on either lead of NOR Gate B turns it OFF. Figure 4 shows NOR Gate A turning ON because there is no current on either input. This lights the bulb and the bit is considered set or in the ON state. Note: A computer clock is merely a device that turns ON and OFF it regular intervals. 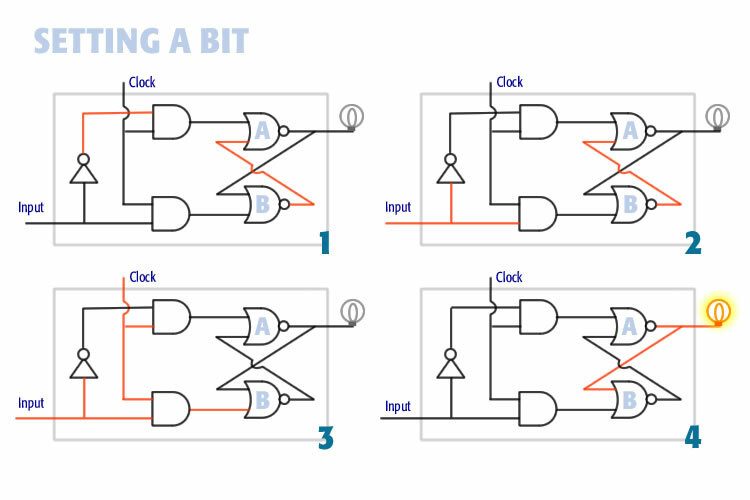 The ON/OFF cycles of the clock synchronize the movement of data in memory. The clock is connected to the input of the bit with AND Gates. For current to reach the bit the clock line must be turned ON. When the clock line is OFF nothing takes place because no current can reach the bit. The clock effectively slices time into discrete sections. When the clock is ON things happen. Switches can be set. When the clock is OFF nothing happens. Dividing time into segments of action/no action keeps data movement in memory sharp.